Szymon Chlebek (32) of Grange Street, Lee Mount, Halifax, given six points on his licence, ordered to pay a £440 fine, £44 victim surcharge, £85 costs for speeding. Victoria Watts (27) of Bradshaw Row, Halifax, given six points on her licence, ordered to pay a £146 fine, £30 victim surcharge, £85 costs for speeding. Nathan Gee (28) of Pellon New Road, Halifax, given a community order, two restraining orders, ordered to pay £150 compensation, £85 victim surcharge, £100 costs for criminal damage and given a community order. ordered to pay £150 compensation for assault. John Matthew Thomas Bell (36) of Brow Bottom Lane, Mixenden, given six points on his licence, ordered to pay £660 fine, £66 victim surcharge, £85 costs for failing to give information relating to the identification of a driver. Jane Blinman (45) of Sharket Head Close, Queensbury, given three points on her licence, ordered to pay a £70 fine, £30 victim surcharge for speeding. Steven Carrington (53) of St John’s Lane, Halifax, given six points on his licence, ordered to pay a £660 fine, £66 victim surcharge, £85 costs for failing to give information relating to the identification of a driver. Jean Charlesworth (71) of School Lane, Illingworth, given six points on her licence, ordered to pay a £660 fine, £66 victim surcharge, £85 costs for failing to give information relating to the identification of a driver. Betty J Divers (74) of Illingworth Road, Illingworth, given three points on her licence, ordered to pay a £220 fine, £30 victim surcharge, £85 costs for speeding. Nicola Williams (30) of Mozeley Drive, Illingworth, given six points on her licence, ordered to pay a £660 fine, £66 victim surcharge, £85 costs for failing to give information relating to the identification of a driver. Samuel Conyers (28) of Ingwood Parade, West Vale, given six points on his licence, £660 fine, £66 victim surcharge, £85 costs for failing to give information relating to the identification of a driver. Amy Miller (28) of Rushworth Street, Lee Mount, Halifax,discharged conditionally for six months, £20 victim surcharge, £85 costs for failing to attend a drug assessment and discharged conditionally for six months for failing without reasonable cause to surrender to custody at Bradford Magistrates Court. Kayleigh Sugden (23) of Marsh Delves, Southowram, disqualified from driving for six months, given three points on her licence, ordered to pay a £168 fine, £30 victim surcharge, £85 costs for speeding. 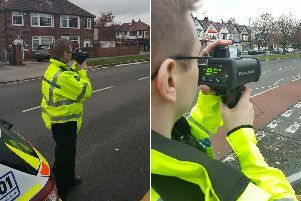 Wayne Smith (36) of Dodge Holme Drive, Mixenden, given four points on his licence, ordered to pay a £293 fine, £30 victim surcharge, £85 costs for speeding.